ROOMS: The 37 guest rooms and 3 suites are beautifully yet simply furnished to reflect native materials and local craftsmanship without detracting from the unspoiled beauty of the surroundings. Some suites and superior rooms can be connected to create a Family Apartment which has two bedrooms, two bathrooms, and a separate living area to accommodate up to six guests. EXCURSIONS: There’s no fitness center at Tierra Patagonia because you’re encouraged to exercise in Mother Nature’s “gym.” The hotel’s expert guides can arrange excursions to include boat rides along glacial lakes, horseback treks, and exhilarating hikes and mountain bike trips. Experiences range in difficulty from Easy to Moderate to High and are offered as half- or full-day outings which means there’s truly something for everyone. RESTAURANT: All meals, aside from picnics taken on excursions, are served in the main dining room. Here guests enjoy Tierra Patagonia’s delicious local food and wine program. Roasted lamb, king crab and Southern Hake are stand-out dishes. VIBE: Relaxed luxury with unbeatable vistas. BAR: The central fireplace anchoring the bar area makes for a natural gathering place. Start the evening with a Calafate sour, a local twist on the Pisco Sour, and then sample some of Chile’s exceptional wines such as Sauvignon Blanc and Carmenere. 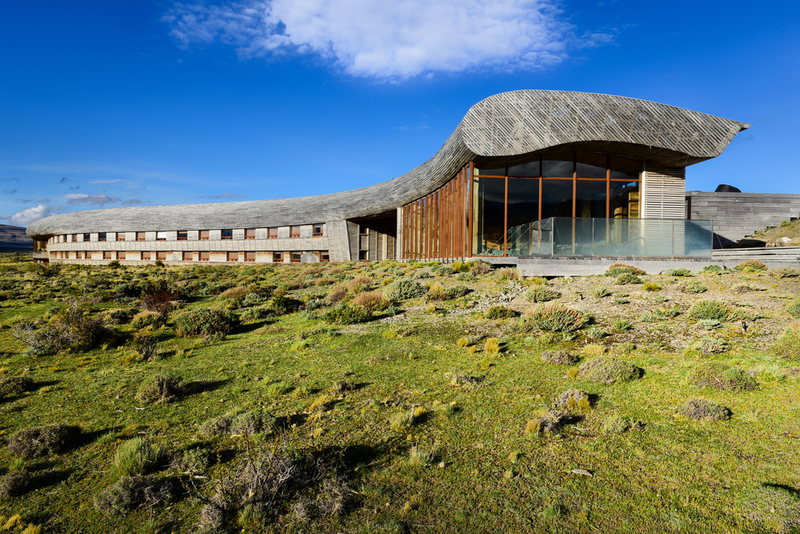 SPA: Tierra Patagonia’s UMA spa is the ultimate way to reward yourself after a day of trekking. The sauna, steam bath, indoor heated pool with jets and outdoor jacuzzi are available for all hotel guests. I highly recommend a massage as a thank you to your legs for carrying you up to the base of the Towers and back. WIFI: Complimentary high-speed internet access, but only in common areas. KIDS: Yes, children are welcome and the hotel offers experiences and meals specifically designed for children in mind. LOCATION: Approximately one hour drive from Puerto Natales and a 4.5 hour drive from Punta Arenas airport (PUQ). Flights from Santiago, Chile to Punta Arenas are 3.5 hours and 4 hours to Puerto Natales. On an unpaved road not far from the Chile-Argentina border, a stunning masterpiece of wood and stone appears on the horizon. Merged with the spectacular surrounding landscape, this oasis on the Patagonian Steppe is perfectly situated on the banks of Lake Sarmiento. The entire length of the hotel features massive windows affording breathtaking views of Torres del Paine National Park from every vantage point. As a contrast to the wide-open spaces and seemingly endless vistas, the hotel exudes a feeling of warmth and coziness. My favorite spot was the “living room” with its life-sized mural of the area’s excursions. You don’t have to go far to explore the hotel’s natural setting. On a walk down to the lake, you’ll see native plants like the Neneo and Calafate bush or prints of local animals such as the nandu (ostrich relative) or guanaco (llama relative). On the black sand shores of the lake, you’ll find ancient, massive coral-like formations known as thrombolites which are found only in a few places in the world. If you plan your visit in spring, you will experience the absolute treat of seeing little lambs nuzzling their mothers just outside the hotel. 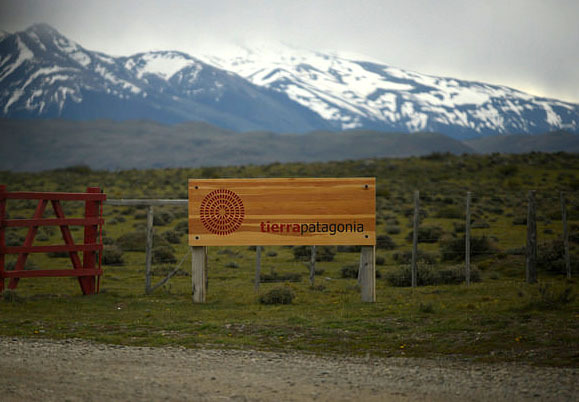 For those who love adventure and exploration but prefer comfort and luxury, Tierra Patagonia is a must-visit.